Did any of you notice my whoopsie posting of these images yesterday? I'm blaming the cat who walked across my lap and the keyboard and accidentally pressed 'publish'. Today I'd like to let you all know about a little project that fellow Aussie nail blogger - Theresa from It's all about the polish has been working on. October is International Pregnancy and Infant Loss Awareness Month. Throughout the month she is asking that we paint our nails blue and pink on a Tuesday to show our support and raise awareness of pregnancy and Infant loss. In conjunction with the wave of polish campaign she is holding multiple auctions of one-off polishes. The money she raises will be donated to Sands Australia. Sands promotes awareness, parent support and understanding following the death of a baby. There are 32 lots of polishes being auctioned. Some are Australian indies and some international indies and there are also some gorgeous pastels from amazing Australian polish brands and other etailers. 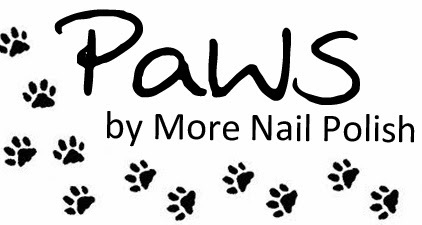 Some of you may know that I have my own little brand of polishes called Paws. I don't sell my polishes. Instead I provide them to friends and family and as special extras when I do swaps or gifts. They are pretty rare and only owned by a chosen few. I was delighted when Theresa contacted me and asked if I would like to donate a polish to her auction. How could I say no? In fact I couldn't just do one polish, I had to do a duo. I wasn't sure that anyone would actually purchase my polishes, but any amount she gets for them will wonderful, because it all adds up. I created two polishes, a pink and and blue and I made up two bottles of each shade. One for me to swatch and keep and the other untouched to auction off. 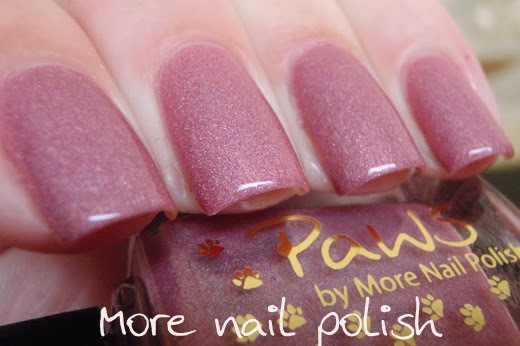 Let me show you my polish duo called "Always and Forever"
Always - Here it is in the sun. You can see the multicoloured shimmer better and also the light purple shade it transitions to. Forever - Here it is in the sun. Again, you can see the multicoloured shimmer better and also the light purple shade it transitions to. Can you check out all the auctions, current highest bids and details on how to bid for polishes on the Wave of Polish blog site. Here is a direct link to my Paws auction page. International bidders are welcome and I will be posting the polishes directly to the winning bidder. I'd also be delighted to do "twin-nails" with the winning bidder should they wish to do so. And I might just throw in a bottle of my Picture Polish Collaboration Shade "Kryptonite" too. Wow, I'm so impressed! I think of color-changing polish as being something really high-tech! They are beautiful. You make the most beautiful colors!